Please join us this week at Bar Boulud as we celebrate the wine of Burgundy. From some of the best Premier Cru and Grand Cru vineyards, with a special focus on Joseph Drouhin’s Beaune 1er Cru ‘Clos des Mouches’ 1983, poured from a Jeroboam. I remember the first time I visited Burgundy. The stars must have aligned because the afternoon was so special it bordered on the cliché. My wife and I had come to watch the Tour de France, and we decided to check out Burgundy before making our way to the Alps. We landed in Paris, on a redeye flight, quickly rented our car at Charles de Gaulle airport, and left Paris in the early afternoon with the old town of Dijon as our destination for the evening. I remember driving, stopping for gas, seeing the nice spread of food at the auto plaza off the highway, and thinking, France really did have a leg up on us in all things things culinary, if this really was a gas station. As we made our way towards Dijon, we passed through beautiful hayfields. I noticed the trees and light looked different than back home, the sky and clouds felt lower. We drove the highway, just south of the Auxerre, close enough to see signs to take the highway there. From books, I remembered that this is where Chablis is located, and maybe my heart beat a little faster to be so close to the source of such great wines. As we drove into Dijon, where we had planned to stop for the night, we realized there was a lot of daylight left. On account of the northerly position of Burgundy, and it being July, the days were very long, and we decided we should drive to Beaune for the night. So we had a snack in Dijon, some charcuterie, bread and coffee, and it began to rain. We paid our bill, then ran from the café to our car, and again needed to get some gas. As I stood there, in Dijon, pumping gas, and smelling the smell of petrichor, which is the name for the pleasant smell of rain on warm, dry earth, I began to get excited for our drive. And then suddenly, the rain stopped. 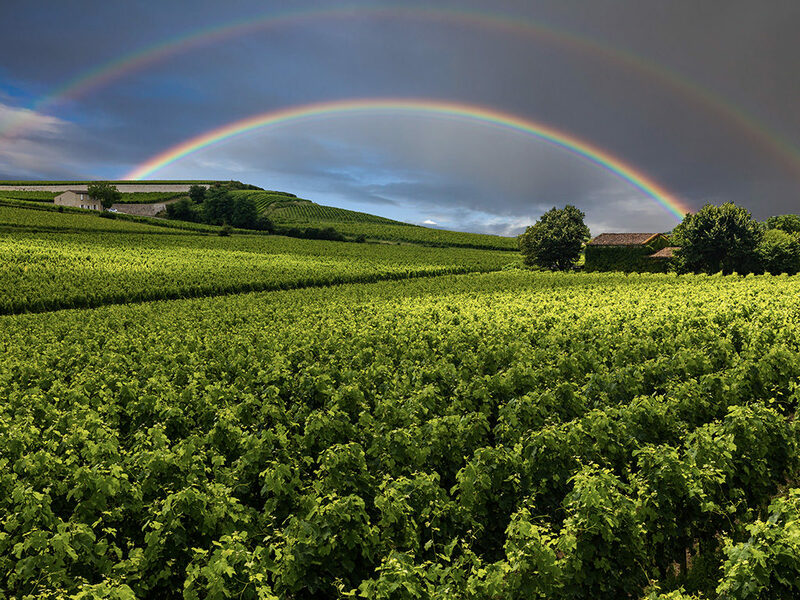 We drove through a small stand of trees, and as we came out the other side, like some sort of technicolor wonderland, the arcs of rainbows energized the air above the Côte de Nuits. We drove through Marsannay and Fixin, and then drove up on the hills of Gevrey, and we felt very lucky. How could we have been in Sunset Park, Brooklyn just last evening? We sat there on the hill, watching a few vigneron out in the vines, seeing the occasional car drive the old Route National 74. It was peaceful before sunset. The vignerons looked at us with curiosity and suspicion. Everything felt quiet and right. We got back in our rented car and the names of the epic villages came so fast, one after the other, Gevrey, Morey, Chambolle, home to some of the greatest vineyards on earth, and so much history. It’s that very history we will explore this week at Bar Boulud. We will open three Grand Cru wines, in particular exploring the terroir of Corton, which Matt Kramer tenderly describes as a “Grand Cru which really looks like a Grand Cru,” as it is a majestic hill, lifted above the landscape. We will also open wine from Échézeaux, and a very special wine from Joseph Drouhin, the 1983 Beaune 1er Cru ‘Clos des Mouches’ from a three liter Jeroboam.